The L.A. Auto Show is right around the corner and there is going to be a lot of vehicles making debuts. However, one of the most anticipated debuts is going to be the 2015 Chevy Colorado. For weeks now the 2015 Chevy Colorado has been teased, and the public cannot wait to see it up close and personal. A photo of the midsize pickup was released earlier in the week, courtesy of Chevy. The photo showed the truck under a sheet, right next to the Silverado 1500, which has just been redesigned, as well as the Silverado HD. The last model of the Chevy Colorado was sold in America, and that was the 2012 model. That was when the model was put out to pasture, and since then there has really only been two options for midsize trucks, which was the Toyota Tacoma and the Nissan Frontier. The automaker released a statement, saying that the newest Colorado was designed to be the most capable midsize truck on the market, as well as the most technologically advanced and versatile. Experts are predicting that the brand new Colorado will be focused on weight savings, as well as more targeted capability than any other midsize pickup that has come before it. It is being said that the truck will be a favorite among families, as well as younger drivers that are searching for a truck that is good on fuel and that costs a lot less to drive than a full-size truck. Chevy has not released much details about the new Colorado’s specific features and capabilities and powertrains, but the public will find out all about this stuff once it debuts at the L.A. Auto Show. However, some experts are believe that the truck will feature a diesel engine, as well as a six-cylinder engine for those who want a smaller engine. If you cannot make it to the revealing of the truck, which will take place on November 20, than you still can watch the revealing live via YouTube. 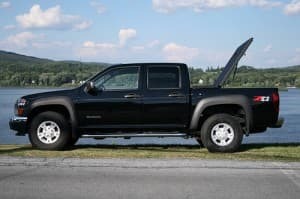 Even though there is not much known about the new 2015 Chevy Colorado, one thing is for sure, and that is many people cannot wait for it to be available on the market. Many people are predicting that this truck could end up being the truck to get for 2014. If you are able to make it to Los Angeles, then you will want to head over to the auto show on November 20, and watch the revealing live.